Giving thanks to God for His many blessings is something we wanted our children to learn while young. 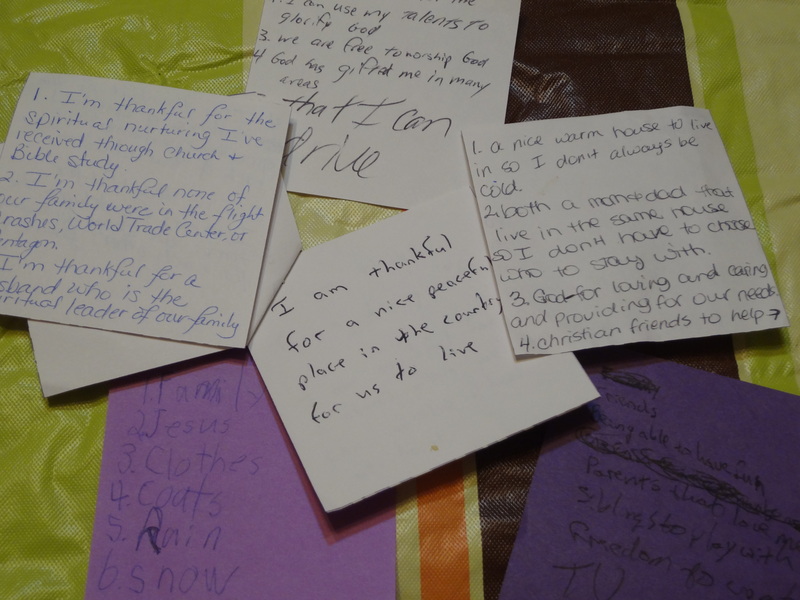 The week of Thanksgiving we were especially intentional in sharing the many things we were thankful for. As you can imagine this tradition has changed shape over the years, but none-the-less it is on-going and a very special part of our Thanksgiving holiday. 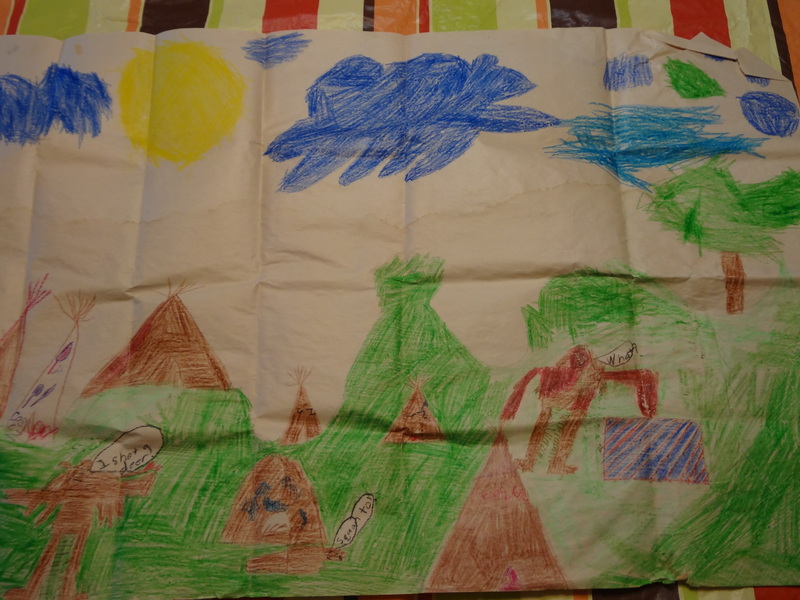 When the children were real young, they drew murals. This may not display much rhyme or reason to you, but they each contributed to the picture, then shared what it was they were thankful for. 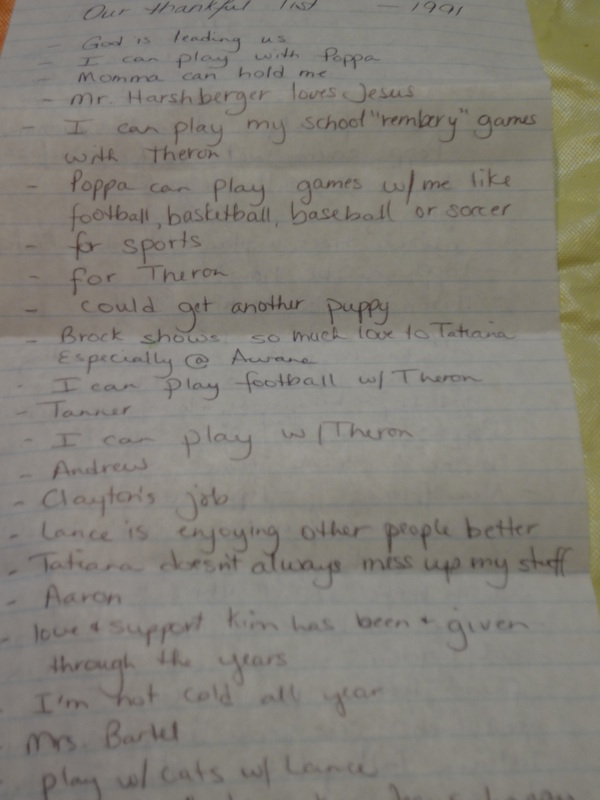 As each child progressed in school with reading and writing, they joined Hubby and I with writing a list. We did not want this activity to become drudgery so we changed it up a bit…writing a note of thanks to each family member. Some years we tried to see how many little papers we could fill with individual blessings. With teenagers and busier school activity schedules, we again altered the tradition. 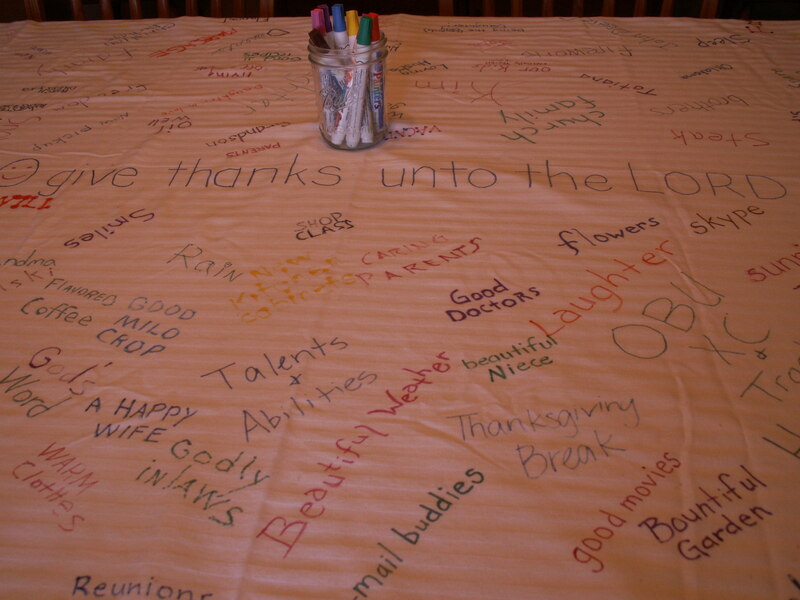 I bought a plain table cloth and fabric markers, wrote a favorite verse of thanksgiving in the center, and after each dinner everyone writes something in which they are grateful. 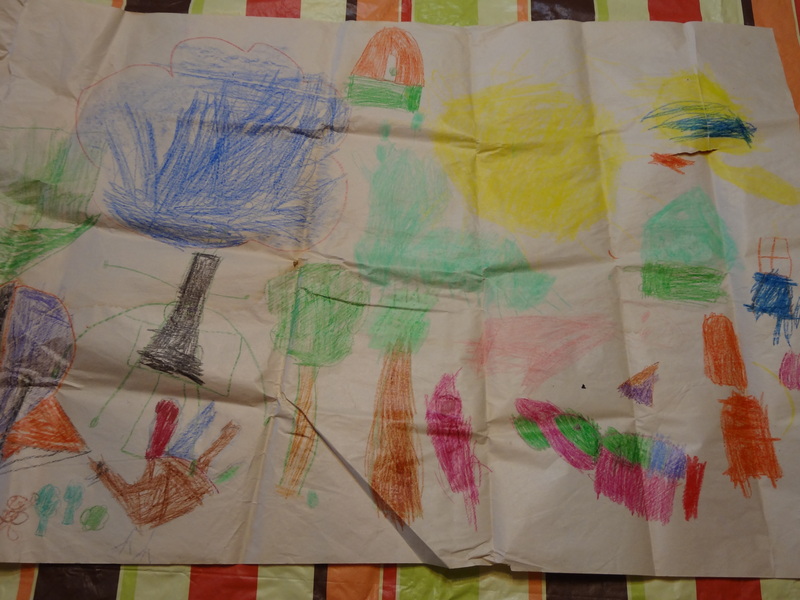 We have been writing on 0ur table cloth for at least 8 years now! What fun we have re-reading each years thanks and then trying to write new blessings that have not already been written. What kind of Thanksgiving traditions do you have? During this week of giving thanks, don’t forget to give thanks to God who has blessed you so abundantly. With Presidential election upon us, I thought it only fitting to share diary excerpts of a young boy who was a not-so-whimpy kid. In fact, he was crowned king at the age of EIGHT! – My dad was killed. People didn’t like him so well, and now they’ve crowned me king of Judah. I know, right!? How can that be, I’m only 8 years old? Being a young king runs in the family, Grandpa Manasseh became King when he was 12, and dad, Amon, was 22 when he was crowned. Things are really a mess, too. This country of God’s chosen people have been led to do much evil and to worship other gods for about 300 years now. However, I am going to do what is right in the eyes of the Lord. – I’m sixteen now and have been king for eight years already. I’ve learned so much in that time. Seeking God is something I have really begun to do. – This is my twelfth year as king, and I am 20 years old. I have given the executive order to purge and destroy all idols, altars and other instruments of evil throughout our country in order to return to being One Nation Under God. – So much has been accomplished in these 18 years of my reign, yet much remains. We have begun to repair the temple of the Lord, Our God. With honesty and fair wages the men have worked faithfully and are making great progress. – I held a press conference today. I read the words of Promise to God, the Covenant. Then in front of my country and in the presence of the Lord, I renewed that promise: “to follow the Lord and keep his commands, regulations and decrees with all [my] heart and all [my] soul, and to obey the words of the covenant written in this book.” (2 Chronicles 34:31) All the people then pledged themselves to the covenant. Young King Josiah – he was no whimpy kid!